Swag Bucks are digital dollars that you earn and can spend on gift cards and other prizes. If you’re not using Swagbucks for your search engine, Start Earning Today. I turn my Swagbucks Digital Dollars into Amazon Gift Cards. I’ve earned over $1,000.00 since I started using Swagbucks. You could be earning gift cards and other prizes, too! Join Swagbucks today! If you’ve already signed up for Swagbucks, don’t forget to use Swagbucks for your internet searches. 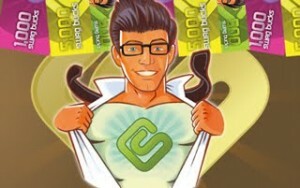 Make Swagbucks your home page and download their toolbar, so you can start earning FREE Money!